The little bit of Easter decor that was out has been put away. The pair of white bunnies lives on top of the china cabinet most of the year! 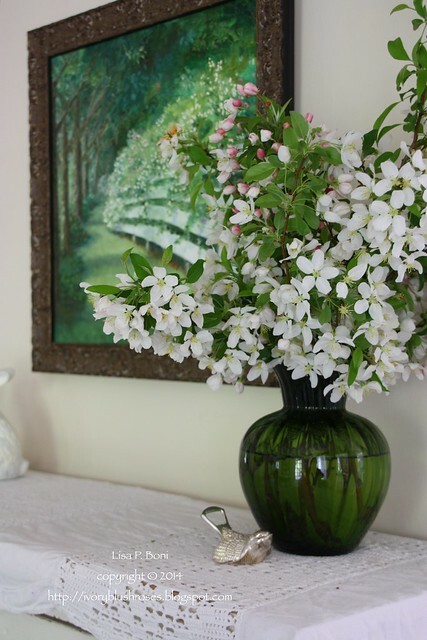 In place of the lovely forsythia blooms which still look stunning, but are in a different room for now, I've placed a vase of apple blossoms! They have to be one of my favorite scents, right up there with lilacs, roses and violets! I wish you could smell these fragrant blossoms! 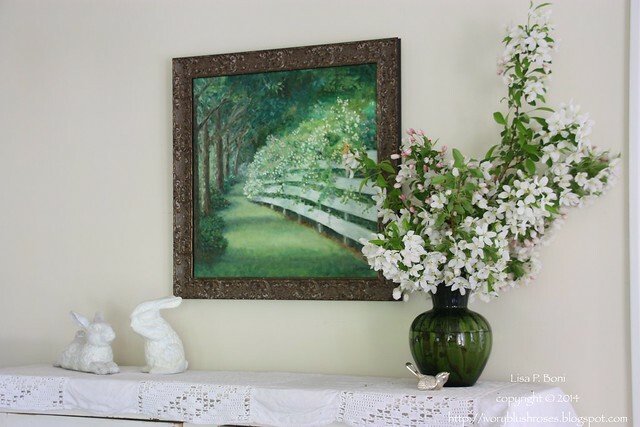 It's a wonderfully heady aroma that fills the dining room with pleasant scent! 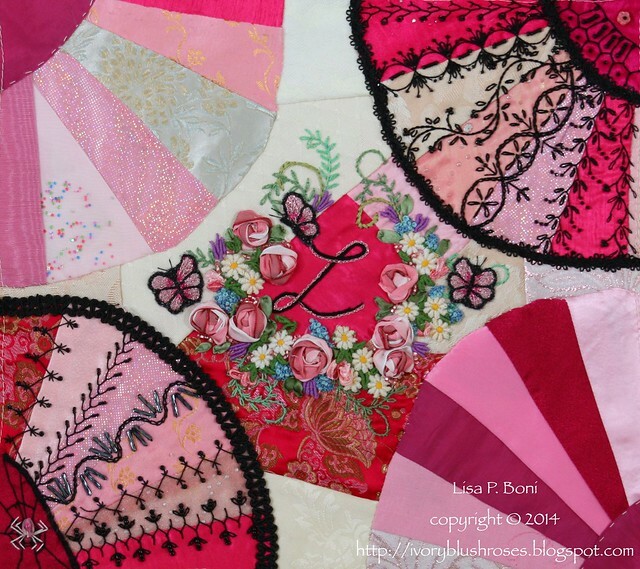 Though the Fans Round Robin is a DYB (Do Your Block), which usually involves choosing one of 6, six inch blocks to embellish, Lisa A choose to do one large block with an equivalent area to work on. Gerry K. did the lovely floral center and Judy D. did the lower left fan. Lisa asked for black to be used on her block, so I followed Judy's lead and did the same. 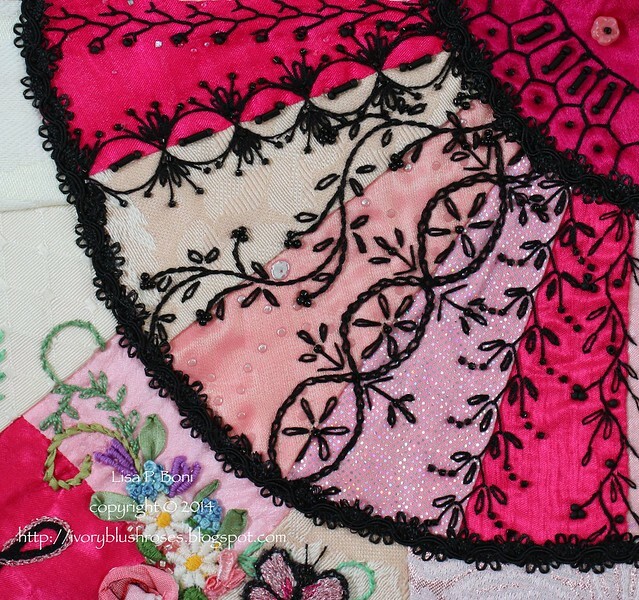 While working in one color might seem easier, to me it is actually more of a challenge as the pattern/design of the stitches becomes paramount rather than the color. Sometimes with color, you can get away with more of an imbalance. Judy did a fabulous job on her fan, and I wanted to complement it, but not copy what she had done. I must admit that if I had this to do over, I'd have chosen a different pattern than the chain-stitched cable. It is a little heavy compared to the other seams. It's also a bit uneven, due in part to the sparkly fabric, which is a slippery knit that I had difficulty controlling. Even with remarking the pattern a couple of times and redoing, work, I could not get it to come out symmetrical. Removing and redoing the stitches was starting to cause damage to the fabric, so this is one instance where I have left stitching that doesn't really meet up to my usual standards. I do hope that Lisa will be happy with it anyway. I spent one day piecing blocks this past week. Hopefully, I won't need to do anymore piecing until after my daughter's wedding in July! This set of blocks is going out in the Hearts DYB round robin. 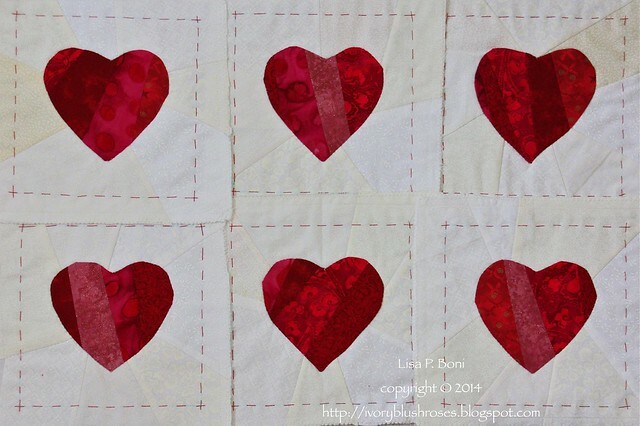 I also pieced several more pincushion blocks for the CQJP 2014. I'll share those as I finish each pincushion! My heart and prayers goes out to all those affected by the terrible storms of this past week. So much damage and devastation. I would also beg prayers for the grandchild of a dear friend of mine who has experienced horrific violence this past week. I am reminded how important it is to put our trust in the Lord God. No matter what we experience, the loss of home, the loss of family members, the acts of violence against us, God is greater, and only through Him may we find peace, wholeness and joy. I think you did an awesome job working with black-only. Lisa will be well-pleased. Love the Psalm...God's word is such great comfort. What lovely work with black only. I like the concept. I love the center flower work too. That is a wonderful Psalm and I pray your friends grand-daughter will feel God's powerful love and healing strength flowing through and surrounding her at all times. When I lived in Michigan, my ex-inlaws had apple and peach orchards. They bloomed at the same time, along with the clover. The orchards were my favorite place that time of year!